Youth - "March for Our Lives"
On Saturday (March 24, 2018) the "March for Our Lives" event was led by surviving students from the school shooting at Florida's Marjory Stoneman Douglas High School a month before. Eight hundred simultaneous marches took place all over the country and worldwide. Several hundred thousand young people and their supporters gathered in front of the Capital Building in Washington, DC. 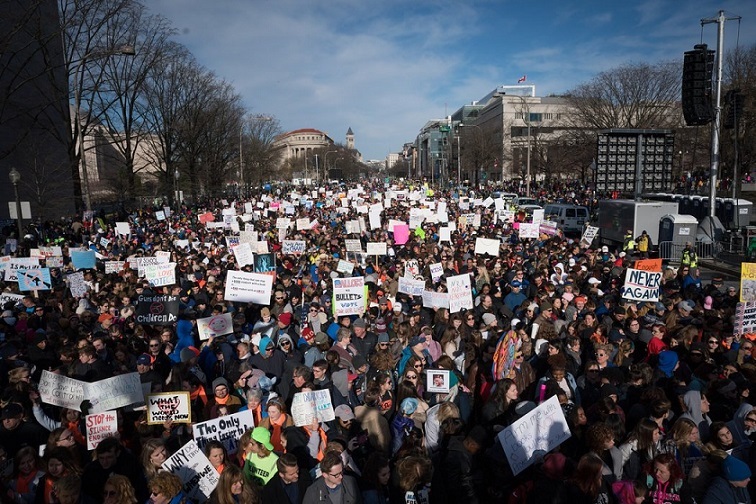 In clear, articulate, consistent and loud expressions, demonstrators demanded change in American politics which has placed easy access to high-capacity, military-style weapons ahead of the safety of kids. The youth who have been the targets of school shooters or have been victims of gun violence in our communities have found their voice and are no longer willing to tolerate political inaction on gun safety issues. They are speaking for themselves, telling their truth, and demanding change. The speeches by Edna Lisbet Chavez and Emma Gonzalez provide two powerful examples. Many other speeches can be viewed on YouTube. We need to hear their voices, feel their emotion and pain, understand their views, and join them in realizing their desire for a safe, just, and equitable society. These youth should inspire us all. They are providing a hopeful message and pointing out a constructive path forward. Their message is rooted in a demand for respect and dignity for all people despite gender, racial, ethnic, sexual-orientation, social, economic and political differences. It is rooted in our shared humanity to place the lives of people ahead of things. It is rooted in an understanding that "justice", "peace" and "safety" are at their core relational in nature - it is how we live with and respond to one another. But that calls for honest, open, non-defensive, non-coercive dialogue in which we hear one another's stories and views. It calls for seeing the "other" as not so different from ourselves. This is what restorative justice values, principles and practices are about. The NACRJ leadership applauds and supports these youth and their activism. We share their vision of a better society. We share their understanding that creating a better society and finding justice require a respect for our shared humanity and a willingness to listen to one another despite our differences. We share their call to address harms and injustices in meaningful ways that get at the heart of problems rather than focus on symptoms through symbolic actions such as zero-tolerance and "target hardening" schools with added security systems. We have done these things for nearly 25 years. Now we hear a call for arming teachers - a new symbolic act. We should all be very proud of the youths in the March for Our Lives movement as they provide a very hopeful vision for the future.